It’s very encouraging that we all continue to demand fresher, simpler, healthier recipes, and that they actually exist! Summer tends to inspire this more than other seasons, with the bounty of fruits and vegetables in season this time of year. As we stand to enjoy a few more sweltering weeks of summer sun before the first day of fall on September 22, we present a recipe that meets all of the aforementioned criteria. 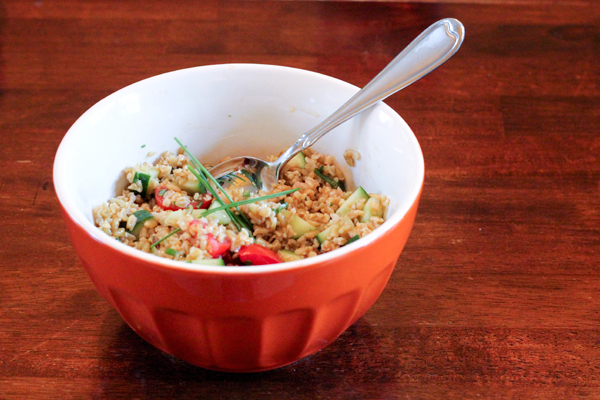 This Tabbouleh-Inspired Freekeh Salad, crafted by guest chef Adriene Rathbun, is a fantastic way to use up the last of your summer garden harvest, as most of these ingredients could be plucked right out of your backyard (or even the farmers market). 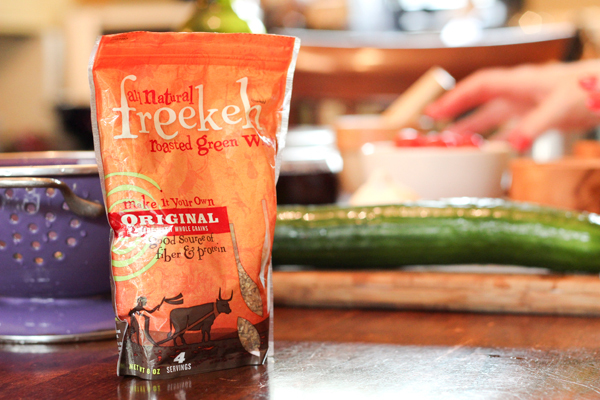 We start with all-natural freekeh, pronounced free-kah, a roasted green wheat with a heartier, nuttier taste than bulgur with a texture and appearance similar to other whole grains like rice. It’s as easy to prepare as a pot of rice – you’ll just need a half-cup for this recipe boiled with water (or broth for more flavor) for about 20 minutes. We like ours on the chewier, al dente side, so we reduce the cooking time by a few minutes. Just one clove of garlic with a half teaspoon of Kosher salt are mashed together to create a paste. 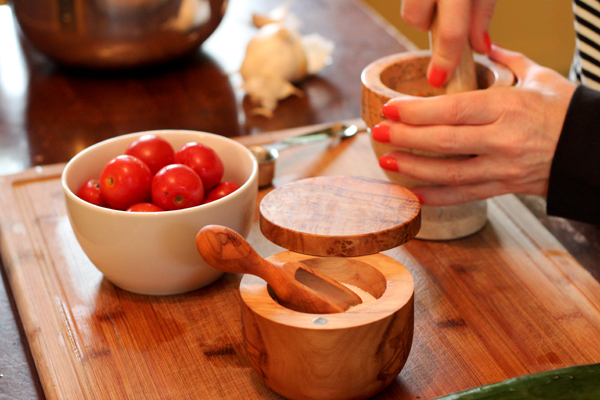 We used a mortar and pestle, but you could just as easily get the same results by using the back of a spoon. 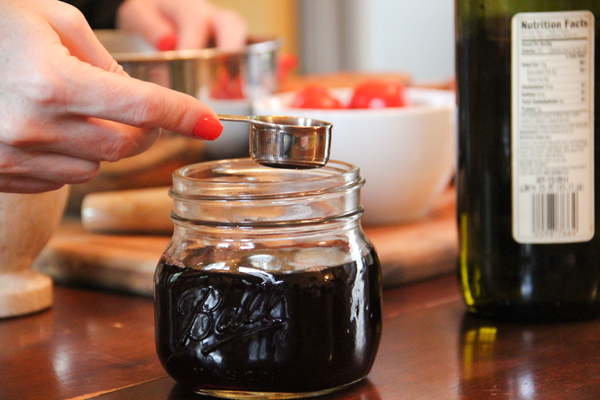 This paste will be added to a simple dressing of red wine vinegar, something Adriene makes at home herself, and extra virgin olive oil. Next, you’ll add the cooked and cooled freekeh to the dressing, most of which will be absorbed by the roasted green wheat. Don’t feel like you need to add more (calories add up quickly with the olive oil); we swear it will be moist and flavorful enough with the called for three tablespoons of dressing. 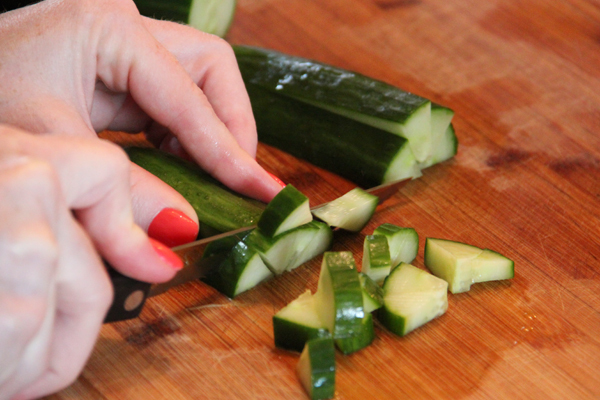 You’ll chop bite-sized pieces of English cucumbers. Fresh-picked are best, but any variety that you have available will work. 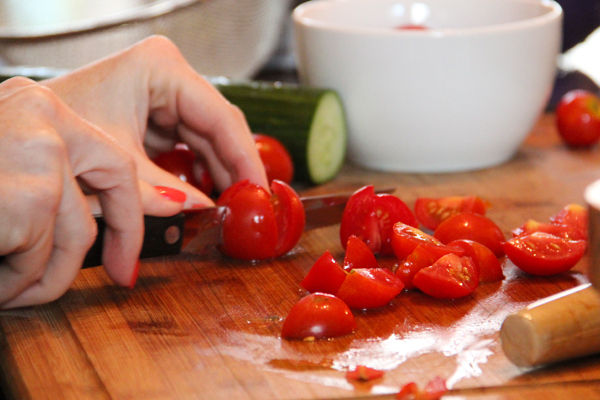 Juicy cherry tomatoes are quartered and also added to the salad, adding a sweetness to each bite. Then, the fresher the better on the herbs. You’ll finely chop chives and a few basil leaves to pull this dish together. 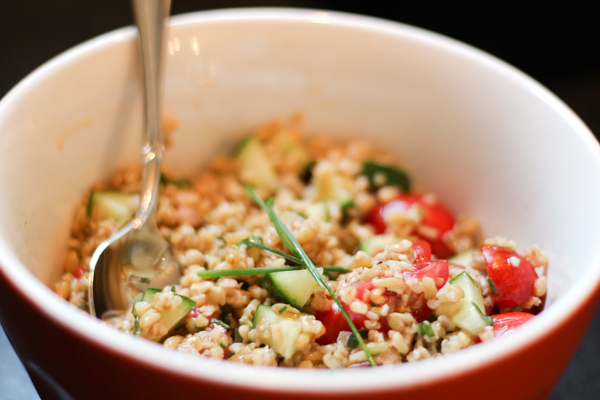 Traditional tabbouleh uses parsley, but we skip that in favor of a taste only basil can deliver. Combine all of the ingredients together and taste. It’s important to taste your food first before adding salt, but you could add up to an extra half teaspoon if your tastes desire. 2. 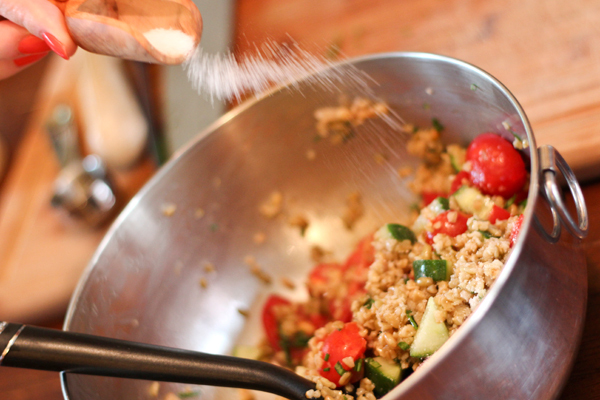 Mash together the salt and garlic with a mortar and pestle or the back of a spoon to create a paste. 3. Add to that the red wine vinegar and olive oil, stir to combine. 4. 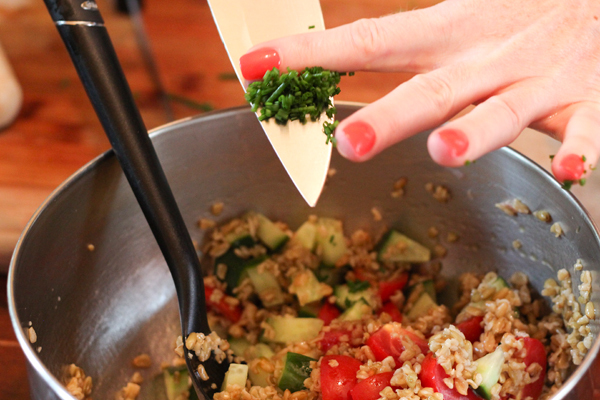 Add the cooked and cooled freekeh, which will absorb much of the dressing. 5. Add the remaining vegetables and herbs and toss until well combined.